Red light cameras are popping up in various cities and towns in an effort to catch drivers who break the law. Luckily, there are ways that you can avoid these cameras if you are careful. It will be almost impossible to get out of a ticket if you are caught on camera committing the crime. The question we have to ask ourselves is how do red light cameras work. Red light cameras work rather simply. The camera is mounted on a traffic light at an intersection. The camera will then take a picture of any driver that crosses the intersection when the light is red. License plate information is then scanned through a computer. A ticket is generated and sent to the offending driver. It is similar to being pulled over without actually dealing with the police. The first thing you can do is download Trapster an app to your phone that will tell you where the red light cameras are. You can even share the location to let other users know where the red light camera is. It is a neat way to avoid these cameras. Knowing where these cameras are will allow you to take an alternate route if you don’t want to waste time worrying about a yellow light at every intersection you cross. 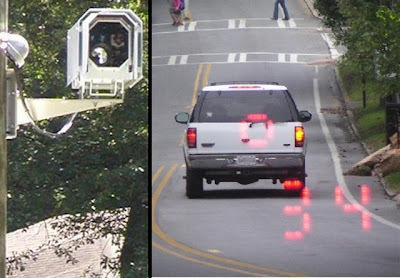 Another way to avoid a red light camera is to know what you are looking for. The cameras are pretty distinctive compared to the traffic light. You will be able to notice the camera from a few hundred feet away. This will give you time to make a decision before you have to slam on your brakes. However, you should be careful about braking too hard just to avoid a ticket. There could be someone behind you who is in a hurry as well. A ticket is much cheaper than getting into an accident. You shouldn’t speed through an intersection to avoid running a red light. There are speed cameras out there as well that could get you in trouble for driving too fast. Do a quick search regarding radar detector reviews to defend yourself against this tactic possibly being used. Remember that safe driving is always the best way to avoid a ticket for speeding or running a red light. Red light cameras have been a questionable way to catch people running lights at busy intersections. Lawmakers insist that they are a way to improve public safety. However, there are many risks associated with them as well. You don’t want people thinking too much when they cross an intersection. You want them thinking about their surroundings instead of whether or not they are being watched. More accidents and crashes can occur when drivers are distracted by cameras. Trapster is a well known smartphone app industry leader in alerting people of when to slowdown and drive more safely. Jeremy Thorne has been involved in the industry for a number of years.